Who is your mommy and what does she do? Hippolyta is queen of the Amazons and mother of the young princess, Diana. That she is, and for a long time, that was the only relation Wonder Woman had: her mother. It gave her something almost entirely unique not just among comic characters, but in culture as a whole; from Jesus to Luke Skywalker, for most of your heroes, it's who their father is that matters; sure, mama might be in the story, but if a parent is going to be important to the plot, it's gonna be papa; that's called a Paternal Narrative. Wonder Woman, by virtue of being sculpted from clay by her single mother, had a super rare Maternal Narrative... right up until the New 52 decided to "clean her up" by making Zeus her biological father, thus making her story just like everyone else's. Hippolyta is played by Connie Nielsen, best known as "the lady in Devil's Advocate who isn't Charlize Theron." The likeness is quite good, adjusting for the general softness present in all Mattel's sculpts. She's blonde, which may seem out-of-place, but is how she was depicted in the Silver and Bronze ages - Golden Age and Post-Crisis Hippolytas had black hair just like Diana. Polly's outfit shares many of the same design elements seen on the other Amazons, such as Menalippe, which makes sense since their clothes are made by the same small pool of people. To show that she's of higher status, her armor is a brighter, shinier gold, and her snakeskin skirt comes down longer, reaching her ankles instead of stopping below the knee. She wears a robe over top of it all, adding to her regal mien, but hers looks much nicer than the one Diana wore. 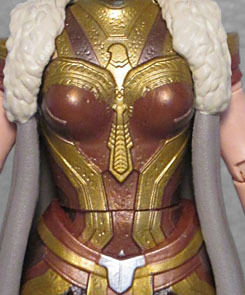 Her breastplate is a stylized bird, a nod to the eagle Golden Age Wonder Woman sported. 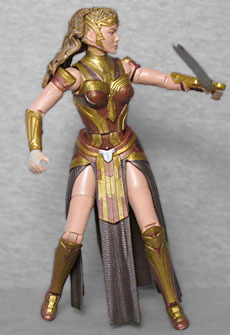 A Mattel figure wouldn't be a Mattel figure without some kind of stupid, easily avoidable problem, and, as with so many Mattel figures, Hippolyta's problem comes in the form of her articulation. As you can probably guess by the fact that she's wearing a long skirt and a longer cloak, no joints below the waist are of much use at all, so while she has hinged ankles, hinged knees, swivel thighs and an H-crotch, we're not going to bother telling you about any of those. The waist is a swivel, but she has no corresponding hinge anywhere in the torso. The wrists are simple swivels, again with no hinge, and there's a duplicate swivel in the forearm beneath the elbow joint. Yay pointlessness! At least they remembered to include biceps swivels, too. The shoulders are swivel/hinges, as they should be, but while the head is a balljoint, her long hair means you won't be doing much with it. Lyta carries two weapons, a spear and a sword. And she really does "carry" them, because there's other no way to store them - no scabbard or anything. The sword has a ram's horn motif on the crossguard, and the spear tip is ornate enough that it looks like a ceremonial piece. Both accessories get slightly bent in the tray, so you'll either have to warm them up in hot water to straighten them, or try putting them back in the tray facing the other direction to make it do the work for you. The figure includes the right arm and left leg of Ares, because Mattel was getting all kinds of wild with this series. The "dark blue and metallic blue" colorscheme definitely owes a lot to comicbook Ares. 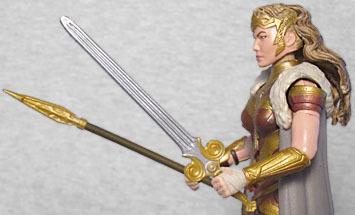 Queen Hippolyta is a typically mediocre Mattel release: not really bad in any way, but not something special you'd look forward to, either. 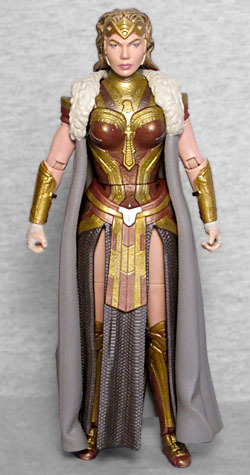 The odds that anyone else will ever make a toy of Wonder Woman's mom, though? Very low. Fortunately, this series showed up at Five Below, and $5 is a price that this toy is worth.